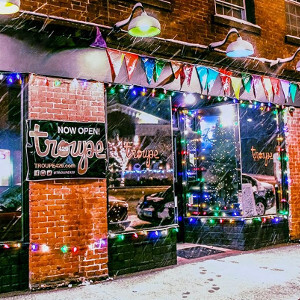 Troupe429: LGBTQ Bar & Performance Space is located in a historic building at 3 Wall Street in the "Norwalk Arts District" of downtown Norwalk, Connecticut, and features drag & music performances, DJs, and fabulous conversation! Daily Happy Hour from 6-7pm! This is by far the greatest LGBTQ space in Connecticut. The owners have gone out of their to create an experience and place to bring the LGBTQ community back together. The bar is designed perfectly for all events that are held here. I drive far out of the way to get to Troupe429 because I am guaranteed a great time. If you haven’t been here... go. Troupe is the place to go that Connecticut has been lacking for years. You’ll always feel safe and welcomed at Troupe 429.